U.S. Sensor Corp.®, acquired by Littelfuse in 2017, is dedicated to continuous improvement in the design and functionality of our temperature sensing devices. Every batch of thermistors is tested for nominal value, as well as adherence to curve characteristics. This information is added to our SPC (Statistical Process Control) database. 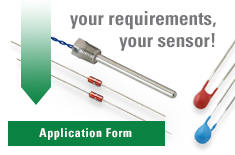 This database dates back to the first lot of thermistors ever produced at U.S. Sensor Corp. In addition to performance tests for adherence to temperature vs. resistance characteristics, devices are tested for reliability in various harsh environmental, physical and electrical conditions. Some of the testing performed on U.S. Sensor thermistors is briefly described below. Groups of thermistors are mounted on PCB's and subjected to a corrosive atmosphere for a period of 10 days. This test exposes the devices to high concentrations of CO2, SO2 and H2S in order to promote product failure in a highly corrosive environment. Littelfuse has developed manufacturing techniques that enable our thermistors to pass this test without failure. Groups of thermistors are subjected to temperature cycling and immersion into both fresh and salt water. Salt and fresh water baths are prepared at temperatures of 0°C and 65°C. The transition between these temperatures is minimized (under ten seconds) creating a Maximum Transition State. At completion of the test, the temperature vs. resistance characteristics must remain in tolerance. The insulation resistance of the device is also tested. Thermistors are subject to one half hour at 80°C and within ten seconds transition, are subject to one half hour at -40°C. This test is typically followed by the 100,000 cycle Thermal Shock Test. This test consists of 45 seconds at 20°C and 45 seconds at -20°C. The transition between these temperatures is minimized to less than ten seconds creating a Maximum Transition State. At the completion of testing the thermistors must remain in tolerance.